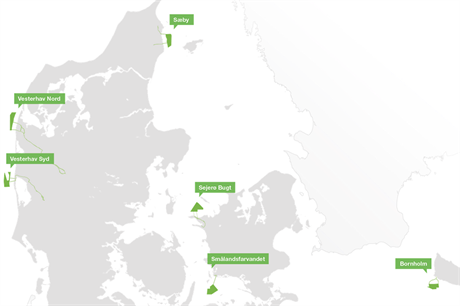 The Danish energy agency (DEA) planned an auction for up to 350MW of capacity, across five potential nearshore sites across Denmark. European Energy CEO Knud-Erik Andersen said he delivered his company's bid by hand to the Danish government. "I cannot say how great the savings are. But it's a significant saving... There is room to build both schools [and] hospitals..." he told the paper. Earlier this week, Danish prime minister Lars Rasmussen revealed a 2025 budgetary plan detailing savings of DKK 7.24 billion, according to Dansk Energi, the trade body for energy companies in Denmark. The plan cancels the 350MW nearshore tender, saving DKK 3.29 billion, Dansk Energi said. A price cap of DKK0.80/kWh was also suggested for the 600MW Kreigers Flak offshore project. Rasmussen's plan also details the phase out of the public service obligation (PSO) support system over six years between 2017 and 2022. The Danish Wind Industry Association (DWIA) said it expects the government to stand by its 2012 decision to support nearshore projects. "Bidders and companies in the wind industry have lived up to their responsibilities and reduced the need for aid considerably in comparison to what the politicians have expected... It is now time for politicians, and especially the government, to live up to their responsibilities and complete the work by appointing a winner," said DWIA CEO Jan Hylleberg. "The global wind industry has turned its eyes on Denmark, where we expect to see a winning bid on the coastal offshore wind turbines, which will probably be the lowest in Europe," Hylleberg added.